When it comes to teaching social-emotional skills, there’s no better tool than the right book to jump-start conversation and help nurture students’ understanding. 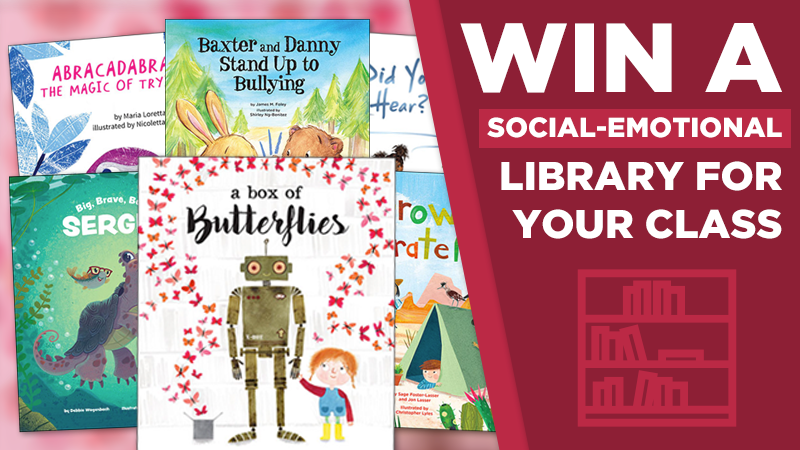 That’s why we’re thrilled to be offering this giveaway of social-emotional titles from our friends at Magination Press, an imprint of the American Psychological Association. Plus 10 more amazing titles! These books address issues like bullying, goal-setting, friendship, and more and are perfect read-alouds for the first weeks of school. So enter today, and be sure to check out all of the books from Magination Press here. No purchase necessary. Making a purchase will not increase your chances of winning. The promotion is open only to legal residents of the United States who at the time of entry are a) eighteen (18) years of age or older and b) currently employed full- or part-time as an educator by an accredited public or private K–12 school in the United States. WeAreTeachers is the official administrator of this program and the American Psychological Association is the Sponsor. Employees of WeAreTeachers or the Sponsor and their affiliated companies, subsidiaries, distributors, sales representatives, agents, advertising and promotional agencies, and the immediate families and household members (parent, spouse, child, or sibling) of each are not eligible to participate. The Promotion is subject to all applicable federal, state, and local laws and regulations. All entries must be submitted using the online form by 11:59 p.m. on November 7, 2018, Central Time. Entrants must follow the entry instructions. Entries generated by script, macro, robotic, programming, or any other automated means are prohibited and will be disqualified. Winners will be selected by random drawing and announced on the WeAreTeachers website by November 14, 2018. Prizing: Five (5) winners: Collection of latest social-emotional books; each bundle is worth $300. WeAreTeachers and the program Sponsor reserve the right to modify, cancel, or suspend the Promotion or any part of it. Win a $1,000 Really Good Stuff Gift Card or a FREE 1 year subscription for your school! It’s the Great Math Storytelling Giveaway!